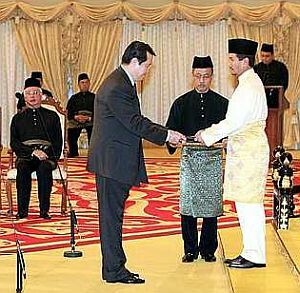 KUALA LUMPUR: Prime Minister Najib Tun Razak's new Cabinet was sworn in before the Yang di-Pertuan Agong Tuanku Mizan Zainal Abidin at Istana Negara here Friday. Deputy Prime Minister Tan Sri Muhyiddin Yassin led the newly-appointed cabinet ministers and deputy ministers in taking their oath of office before the King. The ceremony at Balairong Seri Istana Negara started at 9.30am with Muhyiddin receiving his letter of appointment. Muhyiddin, who won the Umno deputy presidency in last month’s party elections, was appointed Deputy Prime Minister and Education Minister. Five senior ministers Datuk Seri Ong Tee Keat (Transport), senator Tan Sri Koh Tsu Koon (Prime Minister's Department), Tan Sri Bernard Dompok (Plantation Industries and Commodities), Datuk Seri Mohamed Nazri Aziz (Prime Minister's Department) and Datuk Seri Hishammuddin Tun Hussein (Home) then took their oath, led by Nazri. 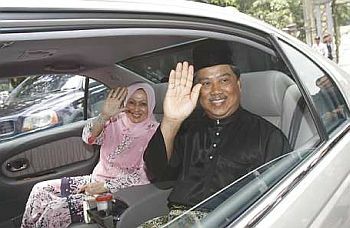 Deputy Prime Minister Tan Sri Muhyiddin Yassin and his wife Puan Sri Noraini Abdul Rahman leaving Istana Negara after the swearing in ceremony. The other ministers and deputy ministers followed, taking their oath in batches of four or five. The ministers are Datuk Seri Rais Yatim (Information, Communications, Arts and Culture), Tan Sri Nor Mohamed Yakcop (Prime Minister's Department), Datuk Peter Chin Fah Kui (Energy, Green Technology and Water), Datuk Seri Mohd Shafie Apdal (Rural and Regional Development), Datuk Seri Mohd Khaled Nordin (Higher Education), Datuk Mustapa Mohamed (International Trade and Industry), Datuk Dr Maximus Ongkili (Science, Technology and Innovation), Datuk Douglas Uggah Embas (Natural Resources and Environment), Datuk Seri Dr Ng Yen Yen (Tourism), Datuk Noh Omar (Agriculture and Agrobased Industry), Datuk Seri Dr Ahmad Zahid Hamidi (Defence), Datuk Shaziman Abu Mansor (Works), Datuk Liow Tiong Lai (Health), Datuk Ahmad Shabery Cheek (Youth and Sports), Datuk Dr S. Subramaniam (Human Resources), Datuk Ismail Sabri Yaakob (International Trade and Industry), Datuk Ahmad Husni Mohamad Hanadzlah (Second Finance), Datuk Kong Cho Ha (Housing and Local Government), Datuk Seri Shahrizat Abdul Jalil (Women, Family and Community Development), Datuk Anifah Aman (Foreign), Datuk Raja Nong Chik Raja Zainal Abidin (Federal Territories) and Datuk Jamil Khir Baharom (Prime Minister's Department). The deputy ministers were then sworn in. Present were Raja Pemaisuri Agong Tuanku Nur Zahirah, Najib, and former prime ministers Tun Abdullah Ahmad Badawi and Tun Dr Mahathir Mohamad. Najib's wife Datin Seri Rosmah Mansor, Muhyiddin's wife Puan Seri Norainee Abdul Rahman, Abdullah's wife Tun Jeanne Abdullah, and Dr Mahathir's wife Tun Dr Siti Hasmah were also present. Najib was sworn in as prime minister last Friday. He announced a 28-member Cabinet on Thursday with 25 ministries that saw eight ministers dropped and seven new faces appointed. Najib, who took his oath of office as the new Prime Minister on April 3, retained the finance portfolio which he has held since Sept 19 last year following a portfolio swap between him and Abdullah at that time.